On Thursday's International Women's Day on Belfast's Shankill Road, one woman's life was recognised by an Ulster History Circle Blue Plaque ceremony. Saidie Patterson, who spent her life fighting for workers rights as well as peace and reconciliation, is a name etched in the history of the Shankill. This was a blue plaque unveiling for a blue collar worker. At the age of 14, Saidie began her working life in Ewarts mills on the Crumlin Road in north Belfast. She later became involved in standing up for the rights of her co-workers. A passion driven by the fact that her own mother, who had worked in the linen mills, had died giving birth because she couldn't afford the doctor's fee of three shillings and sixpence. In 1940, she called for the full unionisation of the Ewarts workforce and called the employees out on strike when her demand was not met. Around 2,000 female mill workers walked through the streets of Belfast dressed in their Sunday best in support of the strike. By the end of the seven-week long campaign, the workforce had secured better pay and the introduction of sickness benefit and holiday pay. Saidie Patterson's leadership skills were recognised when she was made a full-time official in the textile branch of the Transport and General Workers Union in the city, with a special responsibility for women. Baroness May Blood, another stalwart of the Shankill, remembers her as a person not to be underestimated. "Saidie was a feisty wee woman. She didn't like to be crossed. She had her own ideas about things and liked to see them go that way," says Baroness Blood. "She told me once that you have two ears and one mouth and you should listen twice as much as you speak." 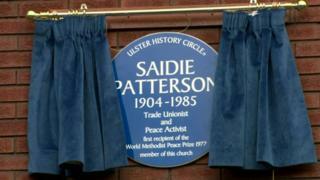 Saidie Patterson also became involved in the early days of the Peace People movement, taking part in mass marches by women along the Shankill and Falls Roads. In 1977, at the age of 69, she was the first recipient of the World Methodist Pace Prize. Speaking around that time, she reflected on the role of women in Northern Ireland. "I was just thinking of the past 50 years and the part that our women have played here in Ulster. We're not just a pair of hands any longer - we're royal souls," she said. The Ulster History Circle has erected the blue plaque to Shankill Saidie on the wall of Shankill Methodist church in memory of a champion of workers rights, but more specifically women's rights. Dr Myrtle Hill of the Ulster History Circle said: "We're delighted to honour this local woman who has played such a prominent role in our history." Saidie Patterson died in 1985.